Remaster mania continues! Just weeks after releasing the iTunes versions, Iron Maiden announce the Onkyo release of lossless remasters. 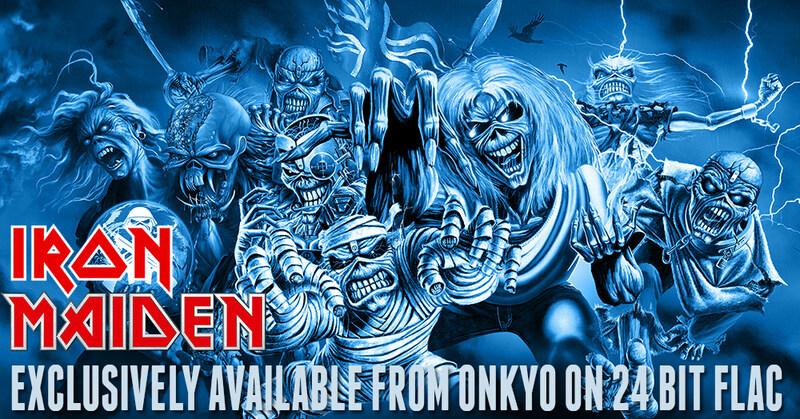 The official Maiden site announced today that their new partner Onkyo Music has released remasters of 19 Maiden albums. There’s no word on which ones but we’re guessing they’re the same 19 as with iTunes. The new thing here is that these versions are lossless FLAC files, unlike the iTunes or Spotify versions and so on. Well, they’re not new mixes, but get ready for the confusion to start on which remasters do what. Anyway, it seems you have to be living in Germany or the UK to be able to enjoy this music on Onkyo’s site, though. US access is coming up, and Japanese fans can go here. This current rolling-out of Maiden remasters is, in my humble opinion, looking like a complete joke. Piece-meal, not even worldwide or format-spanning. If this is the band’s idea of truly entering the digital age and doing proper remasters, which are long overdue, an iTunes exclusive and partnering with a region-conscious Onkyo seems like way too little way too late. Am I being too harsh here, or what are your feelings on this spring’s remaster activity, folks? EDIT: I have access to the material even though the website states UK or Germany, so maybe there’s no regional “coding” on this except keeping the Americans out for a few days…? EDIT 2: These remasters are not being marketed under the Maiden Audio banner that was announced earlier this year, but it IS Iron Maiden and Onkyo, so why not…? Obviously, everyone wants to listen to their favourite band in the highest quality but, I have to agree, this really seems a tad overboard. It seems all this is going on as a ‘filler’ while things are on hold with the new material. Personally, I would have preferred a live release from the last Maiden England tour. Well, I don’t think that’s an either/or, they had probably decided long ago not to release something from the latest tour. And the remaster process was definitely in progress before the completion of the new album and Bruce’s illness. They are probably the same versions used for the 2014 vinyl reissues… I don’t think Steve or Rod would spend all kinds of cash to get them remastered multiple times. As for the releasing… I am more interested in this version than the iTunes release (depending on how Amolad sounds compared to the original cd release). I guess my beef is … Why not make it available on all platforms at the same time? All digital streaming avenues, including iTunes, (whatever Onkyo is in this for), and even CDs? I’m guessing that these formats will turn up as digital hard copies at some point. Maybe like Pink Floyd did with recent remasters, with Blu Ray discs containing these lossless versions. If the Blu Rays also contained a few rarities etc then it would be worth getting excited about. Personally, I have no intention of spending more than the price of a CD just to download tracks. @Robert Jones: It would indeed be strange if the remasters were not made available on CD, especially for a band that has so many fans in places like South America, where physical is still the main thing. But Maiden should have announced it all in one package instead of (potentially) tricking people into buying more formats than they otherwise would. Yep. That is a bit unfair. There is obviously going to be a HD overhaul of the Maiden catalogue at some point, video and audio. But I’m a tad old school. I still listen to old vinyl and am perfectly happy with CD and DVD quality, especially as it’s upscaled on my Blu Ray player anyway… I’d sooner have some rare gold than a slightly improved album I already own three times… And I do believe that gold exists. As with all major artists, stuff is miraculously ‘found’ when it suits them. Listning to 24bit 96kHz 2015 Onkyo tracks from album Piece Of Mind and power slave. WHAT a JOKE ! brickwalled compressed music to laugh about for ages! Yes as the enginer said in thier youtube interview, now u can here how tape sound, much clearer sound. But what the actually music the feeling, thats all gone. the 24bit remaster must be based on the “Mastered For iTunes” masters. So bye the iTunes master to save money. And Better bye the LP or second nest best early CD. They got the music & feeling, dynamic and all. again what a joke thinking that clearer tape sound totaly brickwalled should make things better, what a joke! That was a scathing verdict! Anyone else heard these files yet? Yeah, I did. Jon Von couldn’t be more precise. They totally brickwalled the tracks. The songs sound good but no way near what they could if they had kept the dynamic range intact. It’s a real shame. I will keep my old japanese CDs (pre 1998 bad remaster) as they sound much better and kept the true feeling of the songs. That’s incredible. But unfortunately not very surprising. Like you say, hold on to your old CDs! If they release a new CD range it’s likely to be this new Onkyo remaster, only slightly more compressed.